Creating Marriage Restrictions On European Jews. I have been told that to start this post I should clarify that I myself am Jewish and do have ancestors who died in Croatia during the Holocaust. I never felt compelled to make such a distinction before yet while writing a much longer post from which this article is taken it was pointed out to me such a distinction should be made. This is in part due to the fact that many of our readers seem to be under the impression that I am either Christian or Muslim. Though I have no problem with either religion, I don't belong to them. So with that said I do not take it lightly when I talk about Israel or the Holocaust. Both are dear to me and it is due to that love that I can't tolerate what I see as wrong in my beloved Israel. With that said, here is the portion of this new series dealing with marriage in Israel and the segregation the current system enforces. Marriage in America is depicted as a right that all citizens should be granted to enter into freely. Though we should not take it lightly and the current system in America may not reflect that view we are forcibly pushing for change in our homeland. It has been during this battle over equality in marriage that I could not help but look across the sea at my beloved Israel with weary eyes. For despite America's failures in removing the church from a state regulated legal contract we have at very least removed race and religion as disqualifications for marriage. This is something that I could not say about Israel. On August 1st of 2003 those in charge of Israel found it fitting to expand upon the ethnic bylaws for marriage in Israel. After rushing a new law through the government in Israel offered a it's Arab citizens a new set of laws that would ban the marriage of Israeli citizens to Palestinians. Arabic citizens who chose to marry Arabs from the West Bank or Gaza would therefore be forced to move out of Israel or live apart from their new spouse. The law had dictated that even when married to Israeli citizens Palestinians could not gain citizenship or residence within Israel. Marriage in Israel has always been something of a contentious subject. Jews in Israel are not permitted to marry non-Jews if they want their marriage recognized by the government. Jews who are not considered Orthodox are also banned from marriage to Orthodox Jews in the fact that the state of Israel will not recognize the marriage. This was highlighted in story of Rita Margulis when she, having served in the Israeli armed forces and lived in Israel since the age of four, was denied a legal marriage by the state. For me it has been these two main parts of the laws governing marriage in Israel that has taken my mind back to the days where we Jews were faced with similar restrictions on our decisions to marry. We all know the laws to which my mind wanders. Yet far to often it seems Jews around the world try to avoid the reality of how Israel treats marriage and how we as a people were once treated in the same light. In 1935 the fascists in Germany introduced a series of laws that would live in infamy for the rest of time. Under Nazism the Jews of occupied Europe were officially from that point on banned from marriages with non-Jews. Any marriages that existed from that point on were considered void. The offspring of all these marriages were considered "tainted" and thus Jewish. It didn't matter in reality what amount of blood was Jewish or not, children from these marriages were targeted just the same. "Marriages between Jews and Staatsangehörige (Germanic citizens) or kindred blood are forbidden. Marriages concluded in defiance of this law are void, even if, for the purpose of evading this law, they were concluded abroad." 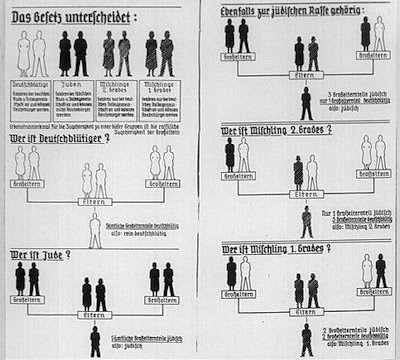 The laws regarding marriages between Jews and Germans (or non-Jews) was so important to the order of Hitler's Europe that it was the first part of the new race laws. The need to discriminate against the Jews in the aspect of marriage was so important that it couldn't wait for economic policies or property ownership to be addressed first. This was in part due to the genocidal efforts of the Nazis and the desire to limit the ability of Jews to reproduce. It was also due to the idea of "blood purity" that perverted the Nazi view of marriage. These laws had direct effects upon the Jewish population of Germany from the very moment they were implemented. "They also, at the same time a law took effect that did not allow a Jewish person, male or female, to go with a gentile person, male or female. At that time, I was going with a nice young lady that I had gone with for some time, and we were out camping, I remember very well. I had a kayak, and we went out camping near Hamburg, and there was a fellow and, next to us, near us, in another little camp with a tent, we slept in tents. He wanted to make a date with this young lady that I was going with, and she didn't want any part of it. He reported me to, to the Gestapo, and I was arrested for going with a gentile girl. I got six months in prison, solitary confinement in 1935." In Israel the laws regarding the marriages of Jews to non-Jews may not word for word reflect the harshness of the Nuremberg Laws of 1935, yet the spirit of the law does. Despite the notion of being the one true democracy in the Middle East the reality remains in question when such laws are permitted. If the letter of the law is allowed to be interpreted in such a manner that it denies citizens basic human rights then the spirit of the law is dead. And without spirit the nature of democracy crumbles. When we add in the laws that deny citizenship, revoke citizenship, or restrict the rights of certain citizens due to the religious or ethnic heritage of that citizen the spirit of democracy is faded even more. A democracy cannot tolerate the denial of human rights to any member of it's society if it desires to be a vibrant and healthy democracy. Yet in Israel, a purported beacon of democratic values, the spirit of Nuremberg taints the letter of the law when the state approaches marriage from this angle. The most basic answer to this problem is the lack of "civil marriage" instead of Orthodoxy governed marriage is the disbanding of the Orthodoxy's monopoly upon the state sponsored establishment of marriage. For us in the United States this was supposed to be solved through the separation of Church and State. For Israel however the state is nearly governed by the Orthodoxy in the fact that despite being a democracy Israel is a Jewish state. It is an aspect of the relationship between Orthodox Judaism and the state that has long hindered any such separation. For people like Rita Margulis this means that even being a Reform Jew in Israel means having fewer rights than those who subscribe to Orthodox Judaism. As for the Arabic Israelis, such laws add further pressures upon a portion of the population who was polled in 2007 as being 47% "less than patriotic". Such laws undoubtedly do not help create more patriotic Arabic citizens or even promote pride in "Jew-ish" citizens. And yet these laws continue to be enforced and thus help to segregate Israeli society. Now, while I do understand that the comparison to Nazi laws may be considered offensive, this undeniable haunting reminder of such laws is meant to make you think. In a modern society should we accept the notion that religion or race should have anything to do with whether two people are permitted to marry one-another? Or should Israel be forced to rethink it's position upon marriage and the approach the state has taken to the issue thus far? As for Alder's Ledge it is a sad reality that such laws still persist in a country where the values of liberty and freedom are espoused by both citizens and politicians alike. We would wish to see Israel take this step as one of many initial steps toward reconciliation with our Palestinian brothers and sisters. For we cannot see a future ahead where lasting peace is established and sustained when such laws are permitted to exist. Legalized discrimination, in this form and all others, will forever be a thorn in our side as long as we continue to willingly suffer it so.